Treasure: The Blasian sensation is baaa-aaack! Jia: I'm Jia Lian Yang, Jia for short, I'll explain later. Last season I was going by Karen. It's still me, people change their names. It happens. Treasure: I'm Treasure Shields Redmond. [giggling] Same name, same mission, to hold space for the voices that mainstream media ignores. Who Raised You? podcast is back, baby! Jia: And better than ever. We’re the 2018-2019 startup competition winners for the Arts and Education Council in St Louis. They gave us ten thousand dollas!! Jia: …And office space to transform the Who Raised You? Podcast into the Who Raised You? Listening Collective. Treasure: This year, we are creating a digital audio archive to combat our region's historical amnesia. We are bringing together artists, poets, and change-makers of all kinds to record stories of ordinary wisdom. Jia: Stories by citizen sound agents coming to a city near you! Jia: Stay tuned at whoraisedyoupodcast.com! Treasure: In the meantime, enjoy season two of Who Raised You? Podcast, a traveling conversation between Jia Lian Yang and Treasure Shields Redmond, as we explore how culture, family, and intersecting identities pave our way toward liberation. We want to know, who raised you? Dig deep! We’re finding our roots. She brought one across the ocean. Only to have it thaw and separate like overcooked meat from its bone. She didn’t know what to say when we first met. My eyes ablaze and my tongue rotten with it. She takes the flashy bus tours and stays in the most Western hotels. Where she should not have to quarry the ruins of her mother tongue just to speak to strangers. I have done yet another thing she could never. Because without words what would we then have to know? Jia: Today, Who Raised You? Podcast goes West. I grew up as a second generation Taiwanese-American in Silicon Valley, And Treasure took her talents to Oakland as a hip-hop artist signed to MC Hammer's label! Treasure: Shh! Don't tell everybody. Treasure: (laughing) We are not at our kitchen table, but we're still having conversation in a communal space. Jia: So we thought it was really important to go West, because we have these different roots. “Who raised you?” is such an important question. And it would just be such a missed opportunity if we didn't go to a place that in some ways raised us. 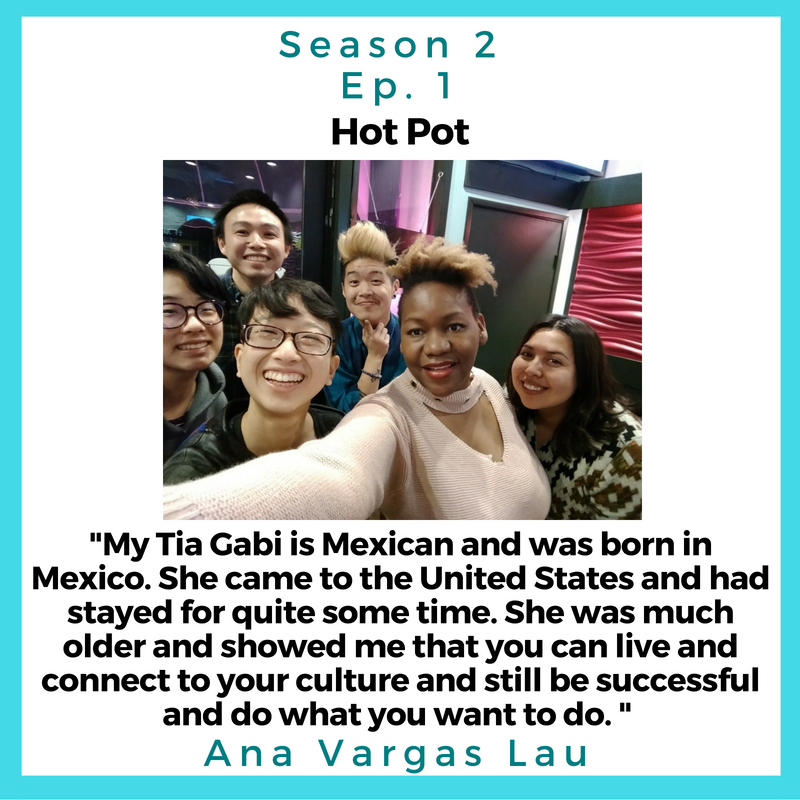 And I have to tell you, we talked about immigrant parents, identity, ideas of home, hyphenated identity, the centrality of food in our cultures, and of course we found out who raised these incredible friends of Jia’s. Jia: So, the people that we talked to were of course my sister, Jessica Yang, who is located more in the Bay Area. And then closer to Oakland, we have Eli Chi, who is a wonderful friend who does a lot of work in queer spaces with young folks, but also hosts amazing, fun dance parties that I have not yet been to, but I hear they're really good with DJing, so he's great! Jia: And then there’s also Ana and Brian. I went to school with Ana and Brian studying social work, and now Ana does a bunch of advocacy around making sure that Latinx folks have collective power and the resources that they need. And then Brian's more in the education space. Oh! And shout out to my sister, she also does writing and she in the future hopefully she'll have some books come out. And she does a lot of thinking around how can we give people access to young adult books by people of color. Treasure: Yes. And like I said, it was an amazing conversation. There was amazing food. It was so good to get back to the West Coast for a lot of reasons. And I think we're going to have to make it to Mississippi at some point now! Jia: Yeah definitely! I'm so excited! Jia: Soul food of any kind is my jam! Enjoy! You raised me to be ohhh, You raised me to be, You raised me to be yeahhh…. Jia: Okay okay okay. Hello! This is Karen Jia Lian Yang! Treasure: And Treasure Shields Redmond. Jia: Where are we today, Treasure? Treasure: We are at the Hot Pot Factory in Chinatown, Oakland’s Chinatown, in the town, Oak-town. (laughter) Ey-ey-ey! And Karen is treating me to this wonderful food and company and, Karen who all is here? Jia: So we have Ana on my right. Jia: Can you say a little bit about, you know, what occupies your time? Brian: Hi, this is Brian. Brian: They can’t see me waving! Jia: She's giving a look of like, I'm so disgusted. Jia: That's Jessica in a nutshell. She's an introvert, I'm an extrovert. It's a miracle how we came from the same parents. Jia: Eli, you do a lot of cool fashion, and also a lot of dancing around. And you're also somewhat tender, shy. Eli: I do lots of things. I do admin work by day for a non-profit. And outside of that I throw parties for QTPOC folx, and do a little DJing now. Eli: Trying to get back into performing drag. So, we'll see, we'll see. Jia: Yep. That's right. So at Who Raised You? podcast, we recognize that everyone is more than what they do, and so we have are very important question which is: who raised you? Ana: No pressure, right? Who raised me? So I was raised by two Mexican immigrant parents, who were undocumented up until I was maybe like 9 or 10 years old. And I have two older brothers as well. So that's my immediate family. And I stayed with them pretty much until I was 19, when I left to Boston. And I was raised for two years by my aunt, Tia Gabi. And she's actually not my aunt, she's my grandma's cousin. (laughing) But, you know, she's still my auntie. So, she raised me in sort of more like stuff sort of that my parents really couldn't support with, like more professional development and schooling and all that stuff. So she really helped with that. Jia: Cool! And what about you, Brian? Who raised you? Brian: I was raised by Chung and Dolly Lau, my parents. They are two immigrants—well, my Mom technically is a refugee. She came over from Hong Kong in the 50s with her family and lived in San Francisco Chinatown, grew up there, all through the 60s, 70s, 80s, all that time. And my dad, who immigrated to this country in 1970-something, also from Hong Kong when he was a teenager. Jia: So, Jessica. (laughing) I am mindful that sometimes the people who raise us are not always our biological parents, but also include those. So you can feel free to answer this question however you want! Who raised you? Jessica: Well, first of all, the same people who raised you, ‘cause we're siblings! Jessica: So it was like “Mom” and then, “Little Mom.” And then also, I guess, like a lot of books, because I remember at one point when I was a kid, I was thinking like, I learned a lot of morals like don't lie, don't bully. And I was thinking, Mom never actually told me that! I picked that up from a book! Jessica: So it was those factors, mainly. Jia: So, no surprise that you also read books, diverse books, and review them. And also write things, yes. So who raised you, Eli? Eli: So… my folks are Chinese immigrants, immigrants of the Chinese diaspora in Cuba. So they immigrated to the States in the 60s from Cuba. Ummm, yeah, so they moved to the States. They raised me, and then also my mom's mom, my grandmother. She lived with us when I was growing up, like all through, up until 5th grade when she passed away. She definitely helped raise me as well. Jia: So all of these people I've known before, but this is your first time, Treasure. Do you have any questions for them? That have come up from the conversation? Treasure: Well, you know, I got to go there with the immigrant parents. I think it's so interesting that everybody at the table comes from immigrant parents. And Eli and I were talking outside about this kind of moment of feeling like you need to find your roots, because you've been raised in spaces where whatever your ethnicity was—it is not the majority. So I'd like to know from each of you, have you felt like you've needed to travel to find your roots or center yourself more in your culture? Cultural identity? Has that been a journey for you? Ana: Oh, okay, I'll go first. Jia: It could be anyone! You could popcorn. Ana: Yeah! I think probably one of the first experiences where I’m like, “Oh I'm actually not, like, white!” is when I was…I don’t know if you’ve ever seen that experiment with the two--with a black girl and then the white girl, and then the dolls? They like the dolls and then they choose the white doll every time, and saying “she's pretty” and things like that? Ana: So I think I had things like that when I was younger, the idea that the white little girl with the blue eyes is like--and I think not really seen myself as Mexican, even though I spoke Spanish because that was my first language and our family, we always did the very cultural Mexican stuff. And so that part, was really there, but I also felt like because I went to school in mostly white schools, and then it was all English, from there, I think it was a little bit harder to cement my cultural identity. So then traveling, or going to college and feeling like--I went to college in Boston--and also seeing that my Tia Gabi, she's Mexican and she was born in Mexico. And she came to the United States and had stayed for quite some time before, and she was much older. Ana: --be successful in what you want to do. And I think that was hard, because there wasn't a lot of examples for me growing up the like, hey I can study psychology and I can do social work and I can get my Master’s and all that stuff. But I also can go to cultural parties and enjoy all this other stuff, and eat food that I really love to eat! Ana: Mexican food! And then also explore a little bit outside of that and sort of enjoy other cultures as well. So not only just Mexican culture, but also being exposed to Chinese culture and all that stuff. Brian: I think having an experience while traveling actually maybe-- it helped me identify my roots probably in a way that you wouldn't think. I went to study abroad in China for a summer when I was in college, and following that did a couple of days in Hong Kong. And that experience just kind of-- that was for me realizing that my identity is really grounded in American and Asian American political identity. And when I was in China, I was not feeling connection. I wasn’t feeling like there was--for me, I don't speak the language, I don't speak Cantonese or Mandarin very well. And that has always fueled a little bit of just distance, I guess, between myself--and because I was going when I was in college, and I was in college surrounded by progressive Asian-American Pacific Islander organizations and students and… I think, yeah! The process of traveling made me realize how much that America is my home, and how much my connection is to this country. Brian: And how much my identity is that unique Asian-American identity, which is very different than identifying as, I think, you know, Chinese or any other Asian ethnicity. Yeah. Jia: How about you, Jessica? Jessica: Oh. Well, I've always felt super Taiwanese, and you know I grew up in Silicon Valley where there is hella Asians. Jia: Say that hella again for NorCal! NorCal! Jessica: But the one thing I had issues with, was that I grew up reading, and a lot of my favorite books were fantasy books by white people, with the exception of Laurence Yep’s cool monkey dragon king series, which was the bomb. But outside of that, it was all like fantasy books by white people. And then when I went to college, I met a friend, Elise, who was like “Oh, I'm so tired of these white dude authors!”, and I was like, What is she talking about? And then she was like, “Oh, you should check out this author, Zen Cho.” And then I read a bunch of Zen Cho’s short stories, which she's a Malaysian author based in London. And she incorporates a lot of her culture and her upbringing into her short stories, and they were incredible and it was the first time I'd read a short story that incorporated different languages and, like, all these different cultures and things into them, and it was incredible! So I was just like, “Whoa, mind blown!” And then I started doing YA Lit POC blogging, so shout out to Rich in Color (richincolor.com). But, yeah, so, that was my thing. Jia: Yup! And I will say, Jessica may or may not have had a hand in the new Rich in Color Instagram. What's the handle? Jia: And shout out to Sorcerer to the Crown and Spirits Abroad by Zen Cho. Jessica recommended that I read them, and they are amazing. Jia: What about you, Eli? Jia: Speak back to it! Yeah! Eli: Things that I'm thinking about, is that I'm just really thinking about: being raised in white suburbia, as well. Jia: In Minneapolis? Where was it? Eli: --And the suburbs of Boston, in New York City. I was in Massachusetts and Connecticut and then Minnesota for high school. But yeah, white suburbia. Eli: So definitely, like, I don't know, I just think about like, assimilation. I was thinking about that. Yeah. I'm sorry, I forget, what was the original question? Treasure: Do you feel like you've been traveling? Treasure: To embrace culture, to find your roots? Eli: Totally! I feel like growing up, I would visit--So my grandparents, when they moved to the States, everyone eventually settled in New York City. That's where my parents lived, and I was born there. I grew up going there, and I feel like going to New York was very much a part--that, to me, was very centered in our culture. Like, going to Chinatown, being with the family, being with the grandparents who are more traditional in that sense... But that would only happen when we would go and visit them, right? Eli: Like be in that space. And then as I grew up, I mean, again going to school with all white folks, it was college in the suburbs of St. Louis. Yeah, I don't know, I feel like it wasn't until I got into organizing that I really started to seek out other Asian folx. But also yeah, I found myself traveling. So while I was in St. Louis as an adult I found myself traveling to other cities and seeing all these queer Asian communities and like, the Bay! I mean, I was like, “Wow, this is here!” Yeah, that's what drew me to move out here. Jia: And that is-- so, I'm mindful that we are around hot pot, which is a really communal food experience. So, I want you to name quickly, like, one food experience that you have that is just very community-centered. I would love to hear that. Ana: Okay! So there’s this thing called taco placero. And it's actually-- it's tacos that are--you put like, what’s it called, like the pig--it’s a really hard, it’s called chicharrones? Ana: --Yeah, pork rinds! (laughing) There you go! Anna: And then avocados-- like, it's very, very simple, you just heat up tortillas and then you do, like, avocado and cheese and the pork rinds, and everybody just eats it. Like, that's one of those dishes that you eat in front of the soccer-- while soccer is playing in the background and you’re--like, on whatever day soccer plays (laughing). But yeah, so I think that that's like, taco placero is probably one of those things where I can remember, oh, everybody just eats it and we all get together. And it's super cheap! So I think that that's a big hit right there! Brian: I don't know about any specific type of meal or anything like that. I just think I just think that, you know, Ana and I really value having potlucks. Brian: That’s something that we’ve always kind of found as our way of showing affection for our friends and people that we love. And to kind of tie it back to who raised you, I think that that influence for me didn't come from my parents. I mean, they obviously cooked for us and they cooked from love. But the idea of having people over--that's something that I got from friends in college and friends in high school. Where it was kind of like, I feel like this is our chance to be able to be grown-ups a little bit. Brian: I mean, this is our step into having adult relationships with people, that we get to cook for each other. Jia: Yeah. And I have good memories of me and my partner Harrison going over to one of their places and just having great potlucks and games and feeling that sense of home. You have raised us as well! Jia: What about you, Jessica? Jessica: I’m just gonna say hot pot! Eli: Yeah, or making dumplings! Eli: That was so much fun at Julia’s house! Yeah. Jia: How about you, Treasure? Treasure: But I wanted to share that, like you and Jessica, I was raised in a place that was densely my culture. So, I'm from the Deep South, Mississippi, if you keep walking you'll be in the Gulf of Mexico. Treasure: It is the Deep South. And so, it was possible for me to handle all of my business throughout a day and not see anybody who wasn't black. But! What it also does is give you a sort of an insulation where you don't realize systemic bias until you're outside of it. Treasure: So, for instance, once I became an English teacher, a high school English teacher, I then realized that all of my honors and AP English teachers were white. Treasure: And it made me realize that at my high school, that they were giving the best students, the ones who were readers and who would come to class prepared, to young, novice white teachers. And they were giving all the toughest students to the older Black teachers. So, yeah, you guys made me remember that and make that connection. Now, regarding food. Food is huge in the Black community. You know, [giggles] there are movies called Soul Food! Treasure: Songs called Soul Food! So, of course, you know, soul food spreads with greens and yams and all the traditional foods that find their roots in Africa by way of enslaved food ways are my favorite things to eat. Black-eyed peas and all kinds of root vegetables and greens. So, yeah. And so the food has become a way for us to kind of communicate our love for each other. Jia: These are not Planter’s peanuts! Jia: We are not sponsored by them. Just homegrown Taiwanese peanuts. Jia: And with that, we’ll sign out! And we’re gonna take our signature selfie! Jia: Thank you for listening to the Who Raised You? Podcast, A storytelling project brought to you by the Who Raised You? Listening Collective, featuring media by artists of color in the St. Louis region. To support us, rate and review Who Raised You? Podcast on every platform. Treasure: Visit whoraisedyoupodcast.com to book us for speaking and consulting on arts and storytelling projects. While you're on whoraisedyoupodcast.com, donate to support the Who Raised You? Listening Collective. Put groceries on our table! Jia: We are the 2018-2019 startup competition winners brought to you by your friends at the PNC Foundation and Arts and Education Council of St. Louis. They gave us an office! For this year. Podcasting from the Centene Center for the Arts. Treasure: If you'd like to sponsor us, and have us share your products and services with our audience, let's talk about it! Email us at whoraisedyoupodcast@gmail.com. We'd love to partner with you and share your story. Jia: Connect with us on social media! Treasure: Like Who Raised You? Podcast on Facebook! Jia: Tweet us @whoraisedyoupod on Twitter! Treasure: Slide into our DMs @whoraisedyou on the gram! Jia: (singing) On the gram!